Tom MacCluskey interviewed March 2010. 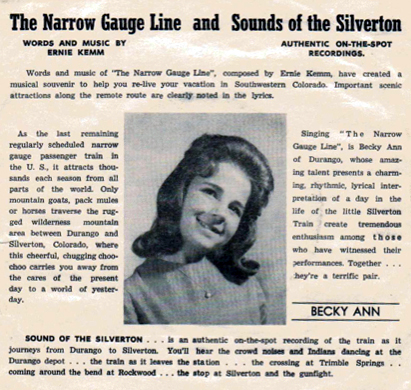 On July 4 1961, The Durango and Silverton Narrow Gauge Railroad was designated as a U.S. National Landmark. 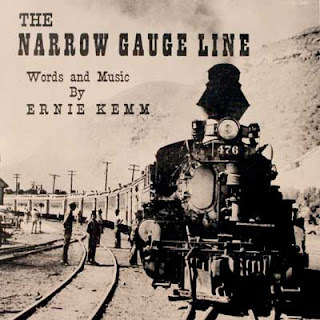 To commemorate the authorization the city fathers hired Ernie Kemm - who would later pen "Here's to Colorado," the state's official centennial song. "We began performing together as a duo in Denver with Al Fike," said Tom MacCluskey. "Ernie was playing piano, I played drums, and sometimes piano." When Kemm received the call to write the Narrow Gauge record, he had a regular gig at the Back Door in Denver. He enlisted the help of MacCluskey to arrange the recording, and put together a group of studio musicians. "I actually hired some of the best jazz musicians in Denver to play on it," MacCluskey said. 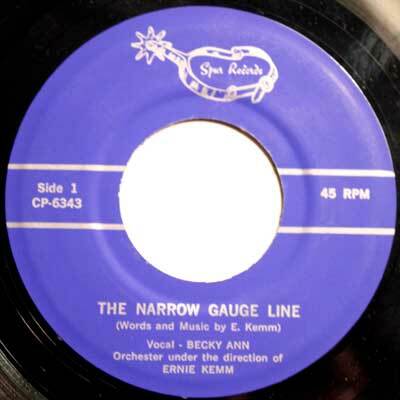 "I had Neil Bridge on piano, and Derryl Goes on drums, who later toured with Stan Kenton." Recorded in Denver, at Western Cine Recording Studio, the record features the vocal stylings of 10-year old Becky Ann Todeschi, of Durango. "I never even met her," said MacCluskey. "We laid down the instrumental tracks and she overdubbed her voice - she wasn't in the studio." Listen to "The Narrow Gauge Line"
The b-side of the single - "The Sound of Silverton" - features sound effects of the train. 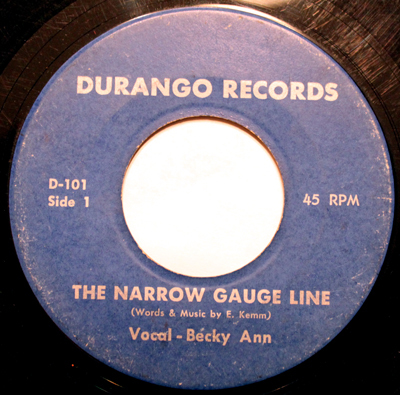 The single was later re-released on the Durango label (Durango 101-year unknown). Tom MacCluskey, who had previously never been to Durango, moved to the town in 2000, and is now a regular performer at the Mahogany Grille. He also hosts a Sunday morning classical music program on KDUR radio. Visit MacCluskey bio on Mahogany Grille site. Shortly after the release of the Narrow Gauge disc, Kemm released another record on the Spur label, "The Trail They Call the Navajo / Songs of the Navajos." He would also go on to record for the Denver-based Band Box label ("Here Kitty Kitty" / "Larimer Square" - Band Box label 369). In 1965 Kemm left Colorado for New York City. He is now a regular cruise ship performer. He was unavailable to comment on this story. Attempts to locate Becky Ann Todeschi were unsuccessful.